Bo just picked up the new jet boat,the Stinger Jane II, and she is a beauty! 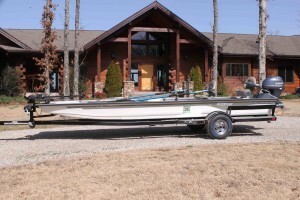 Custom built by Lowell Bereczky II in Flippin, Arkansas, the Topwater 2150 is the ultimate fly fishing river boat. The 50″ width provides more stability and displaces more water which means it operates in super shallow water. The 30hp Yamaha jet drive engine provides plenty of power to quickly get up river. The Stinger Jane II is rigged with 9′ Cataract oars and rows almost as well as a drift boat and is just a wonderful fly casting platform. 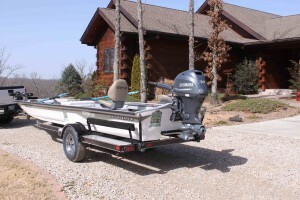 We also have a 24 volt Minn Kota trolling motor just in case Bo gets too tired to row you back to the ramp. The Stinger Jane II was photographed in front of the White River Inn in Cotter, Arkansas, high on a bluff overlooking the White River. After picking up the new jet boat Bo and his wife, Janie, (my real and best master), spent a few days with their good friends, Moose and Tina Watson, the owners of the White River Inn. You can check out this truly first class lodge at www.thewhiteriverinn.com. Bo managed to do a little fly fishing and got the Stinger Jane II rigged out and ready to fish, and yes the Caddis hatch is just getting under way on the White River. Be one of the first to book a fly fishing trip in the Stinger Jane II and we will see if we can find you a Caddis hatch to fish!